Welcome to District 12: #TickTock6 Reveals Catching Fire National Victory Tour! 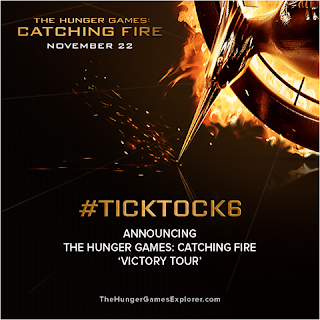 #TickTock6 Reveals Catching Fire National Victory Tour! #TickTock6 has been announced, and some of the cast members are going on a Victory Tour! To celebrate 6 Weeks until The Hunger Games: Catching Fire, Lionsgate is proud to announce that the cast will embark on a National ‘Victory Tour’ November 3rd—6th, 2013. The tour will include stops in Philadelphia, Miami, Minneapolis and Houston. Members of The Hunger Games: Catching Fire cast will participate in special Q&As with fans, signings, and more in support of the worldwide release of the film in theatres on November 22nd. In addition to these stops, on November 6th fans around the world will be able to interact with talent all day through Google, Yahoo!, Tumblr, Twitter and Facebook. Six lucky fans will be chosen in advance to participate LIVE on air in a Google+ Hangout with the cast at google.com/+TheHungerGamesMovies. Enter HERE for the chance to participate! Also, tweet with #TickTock6 & your questions for the cast and you could see them answered during the Nov. 6th event! The tour, in partnership with Covergirl, offers giveaways and exclusive access for fans. At each event, fans are encouraged to bring a canned food donation and support of our non-profit partners Feeding America and World Food Programme. By following #IgniteTheFight and visiting www.hungergames.com, fans can continue to learn more about ways to help end hunger.